The Jaharis Family Foundation, Inc. announced a pledge of a $2 million Challenge Gift that will specifically target hunger and poverty relief efforts to help children and families in Greece. The gift will be primarily distributed through the International Orthodox Christian Charities to support its Hunger Relief efforts in cooperation with “Apostole” (Mission), the humanitarian affiliate organization of the Archdiocese of Greece. The announcement was made to coincide with the official visit of Archbishop Ieronymos of Athens to the US this past May. 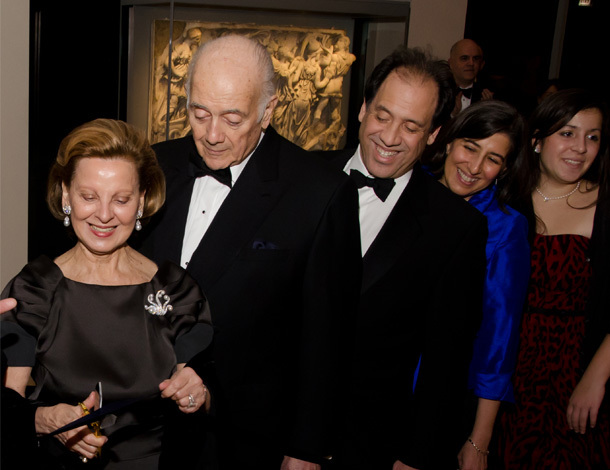 Michael Jaharis, a native of Chicago and son of Greek immigrants, with his wife Mary and their children comprise The Jaharis Family Foundation, one of the most generous supporting institutions of arts, sciences and philanthropy in the country. Michael Jaharis received his law degree from the DePaul University College of Law before he entered the pharmaceutical industry. He was the founder and Chairman of Kos Pharmaceuticals, Inc. He is currently a founder and director of Arisaph Pharmaceuticals, Inc., and a founder of Vatera Healthcare Partners LLC, a private investment firm. Mr. Jaharis is an Honorary Governing Member of the Art Institute of Chicago as well as a previous Sustaining Fellow. He also serves as Trustee Emeritus of Tufts University in Boston; Chairman of the Board of Overseers for the School of Medicine, Tufts University; Member of the Columbia University Medical Center Board of Visitors; Member of the Board of Overseers of the Weill Cornell Medical College and Graduate School of Medical Sciences; Director of The Onassis Public Benefit Foundation (USA); Founder of Faith: An Endowment for Orthodoxy and Hellenism; and Vice Chairman of the Greek Orthodox Archdiocese of America. Mary Jaharis was born in Wisconsin, spent much of her early childhood in Athens, Greece and later moved to Chicago, where she completed middle school and high school. She attended Northwestern University, graduated from the School of the Art Institute of Chicago with a degree in Fine Arts, and later studied at the New York School of Interior Design. She is an Honorary Trustee of the Metropolitan Museum of Art, and on the Board of the St. Catherine’s Foundation, an organization overseeing the restoration of the St. Catherine Monastery in the Sinai Desert. Mrs. Jaharis is Life Trustee of the Art Institute of Chicago as well as a previous Sustaining Fellow. She is also an active member of the Philoptochos. Michael and Mary Jaharis live in New York City. They have two children and five grandchildren.